That's it from here folks. Stay tuned to Sportskeeda for more such live coverage. It's the Indonesia who seals the bout 3-2. A good effort from Pavitra but falls short by a trivial margin. It has been an interesting bout and the results could go either way. We enter the final seconds of the match. Who will have the last laugh? The Indonesian stalking Pavitra in the wait for a perfect punch, but the Indian deals smartly to deny her opponent any room. Precious advice from the Indian coach prior to the Final Round. Pavitra brings experience into play, good pressure from the India. Final 20 second left in Round 2. Pavitra lands some solid punches on the local opponent as we approach the final minutes of the second round. We come to the end of an exciting R1. We are into the final minute of the first round. It's building up to be heated contest as both players pack punches at regular intervals! The players are inside the ring as we get ready for the bout! 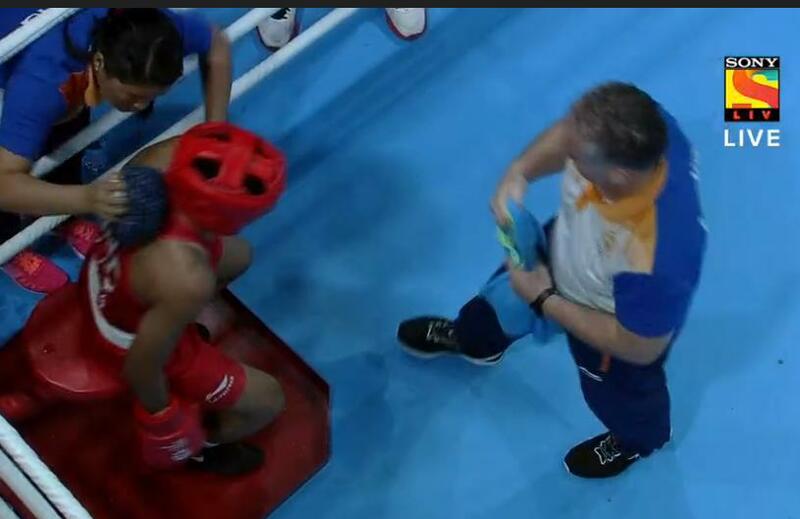 UPDATE: Sonia Lather has lost her quarterfinal bout against Son Hwa Jo of North Korea. 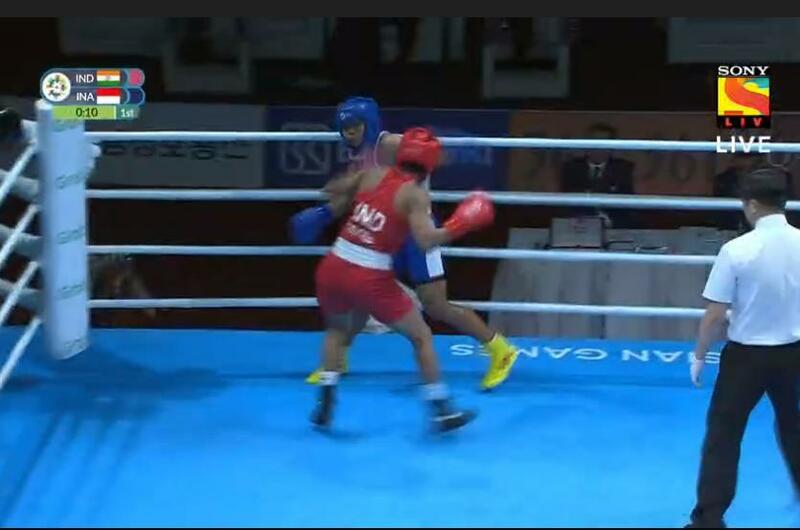 Hello, and welcomme to Sportskeeda's LIVE coverage of today's boxing events at the 2018 Asian Games, in Jakarta-Palembang. There are two bouts today, as far as Indians are concerned. 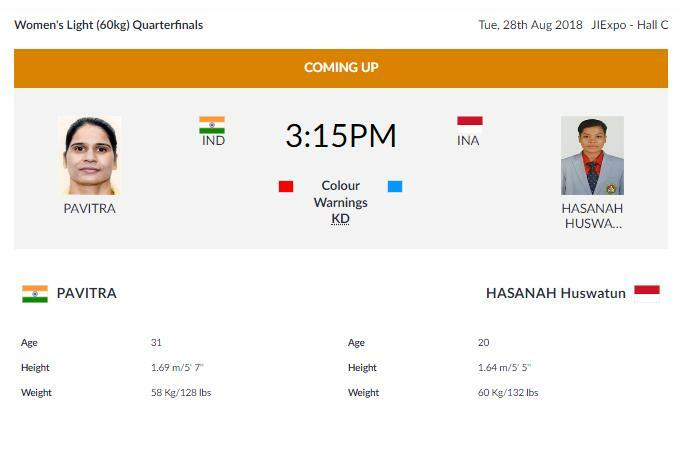 Firstly, Sonia Lather faces off against Son Hwa Jo of North Korea, shortly followed by Pavitra's bout against Huswatun Hasanah quarterfinal. Indian Athletics' unprecedented run at the Games on Day 9. Dharun Ayyasamy won silver in Men's 400m Hurdles event and also broke the national record. Sudha Singh won a Silver Women's 3000m Steeplechase. Another Silver was added to India's tally as Neena Varakil won it in Women's Long Jump. However, the standout performer was Neeraj Chopra, who was also India's flag bearer in the opening ceremony of the multi-sport extravaganza, who lived up to expectations and bagged GOLD for India in Men's Javelin Throw. There was an exceptional outing in Badminton as well. While Saina had to settle for Bronze as she lost to Tai Tzu Ying in the semis, Sindhu made it to the final of the Women's Singles event after her win against Akane and will now face the World Number 1 in the summit clash today. The Indian Men's Table Tennis Team also scripted history as they entered the Semifinals of the event and thereby secured a Bronze medal. They are set to face Korea in the Semis today. There is a lot to look up to on Day 10 of the 2018 Asian Games.